Well, that's what forecasting is about. "The weather forecaster causes rain" is a model that forecasts well. Until you try to kidnap the forecaster and make a sunny day. It sounds like the plot of a very fun movie. With regards to the S&P report on inequality, worries about inequality impacting aggregate demand shouldn't be too worrisome. Aggregate demand is a cyclical issue that can be managed by monetary policy when needed. However, the hypothesis that relatively bad education outcomes are driving both low growth and higher inequality than in the past is more worrisome. The modern education system is ill suited to the needs of many people and those at the bottom of the ladder are increasingly forced to compete on a global basis when they enter the workforce (Or rather, they are forced into local service jobs because of potential global competition). Combined with assortive mating, the children of those with poor education may continue to have poor education and low productivity themselves - thus lowering future economic growth. It should be pointed out that inequality is not the causal drver of growth in this analysis, education and globalization are the main driving factors. And while this is related to inequality, worrying about the education gap is different from worrying about whether or not the growing wealth of the 1% will impact future economic growth. Here is a thesis of how inequality of the 1% and growth might be related (particuarly in more corrupt developing countries): High levels of inequality are sometimes a symptom of excessive rent seeking. This rent seeking is damaging to long term economic growth. In these cases redistribution may not improve growth outcomes unless the rent seeking behavior is itself taxed. Since the most successful rent seekers are generally people with significant political influence, it's very unlikely that they'd lose the battle. But it could still be one worth having. One of my favorite blogs came out of hibernation to comment on Piketty (Warning, it's pretty overtly political), and it reminded me that I still haven't contributed. A lot of ink has been spilled the question of whether or not the return on capital after will be above the growth rate for significant periods of time. The merits of the arguments generally fall on the side of r > g in perpetuity being nonsense. Either labor prices have to eventually rise (on a global basis they are doing just that) or the return on capital needs to fall. How can the return on capital fall? Two ways come to mind. 1. Earnings stop growing. This can happen when effective taxes go up more than prices rise to compensate for the increase. This would also occur if unit labor costs started increasing more quickly than the prices of goods sold and profit margins fall. Already, the sales growth of the S&P 500 has been below the economic growth rate of the economy for the past few years - and this is noteable because the S&P also has exposure to faster growing emerging market economies. 2. The expected return of assets fall. #2 has been interesting - because it is what has been happening over the past few years and yet analysts have if anything gotten more worried about wealth inequality. That's because in order for the expected future returns to capital to fall, prices today need to go up. A company with an earnings to enterprise value of 10% has a much higher expected future return than a very similar company with the ratio at 2.5%. But if the company is earning one million dollars a year in cash, it would have to move from a $10 million dollar valuation to a $40 million dollar valuation in order to reduce the expected return on capital. Analysts looking at the 16.0% total return to the S&P 500 in 2012 and 32.4% returns in 2013 will plug those numbers into models which uses past returns to predict future returns for various asset classes. After the recent bull market, they might assume that the future return on capital will be even higher than it was in the past. 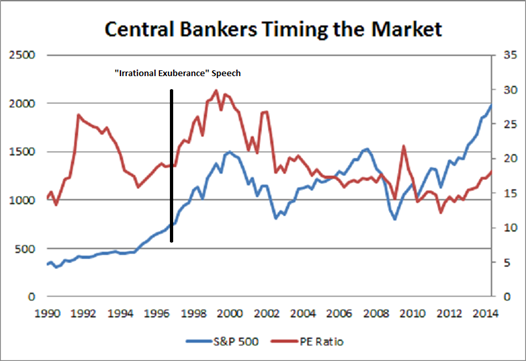 But over this time period, the price to earnings ratio rose from 14.87 to 18.15. In other words, the average earnings yield of all of the companies fell from 6.7% to 5.5%. Instead of concluding that the expected rate of return on capital is higher, analysts should be assuming that future returns will be lower. The same principles apply to other asset classes, but in many cases interest rates are already below the nominal growth rate of the economy. Equities are one of the few places where the earnings yield is above the growth rate. So if we find ourselves watching the stock market go up over the next few years, it actually means Piketty is more likely to be empircally wrong than right in his r > g prediction on a forward looking basis.. Some broad equity price indexes have increased to all-time highs in nominal terms since the end of 2013. However, valuation measures for the overall market in early July were generally at levels not far above their historical averages, suggesting that, in aggregate, investors are not excessively optimistic regarding equities. Nevertheless, valuation metrics in some sectors do appear substantially stretched—particularly those for smaller firms in the social media and biotechnology industries, despite a notable downturn in equity prices for such firms early in the year. Moreover, implied volatility for the overall S&P 500 index, as calculated from option prices, has declined in recent months to low levels last recorded in the mid-1990s and mid-2000s, reflecting improved market sentiment and, perhaps, the influence of “reach for yield” behavior by some investors. 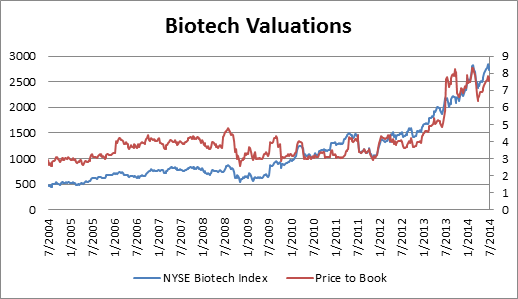 On a price to book basis, it does look like valuations are stretched in biotech companies. The value of biotech companies, and social media companies for that matter, come from intangibles that aren’t measured in book value and are yet to be captured in earnings. What the high valuation tells us is that investors think the expected value of these companies is higher relative to its tangible book value than it has been in the past. That may be because the drugs the new companies are working are particularly promising, or because investors have decided to value the lottery-like payout of biotech stocks at higher prices. But either way, investors can’t be said to be “reaching for yield” in these sectors because it’s exactly the wrong place to look for yield – yield only comes after sales and earnings exist. The beta of the Nasdaq Biotech index to the market is 1.2, which implies that biotech stock valuations are being moved by factors other than whether or not their drug trials are going well. Part of the explanation may be that in a high liquidity environment the market will value lottery tickets more highly. 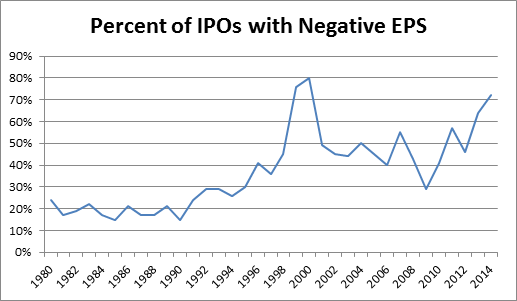 A higher proportion of companies with no earnings have been going IPO since the 1999 tech bubble. And the companies with no earnings will on average have bigger IPO day pops than companies with earnings. It’s almost as if there is something about real earnings that makes investors look more skeptically at a company. The Federal Reserve report also mentions low interest rates, and compares them to the mid 90’s and mid 2000’s. Data for implied volatility doesn’t go back much farther than the 90’s, but we can look at the historic volatility as a proxy. 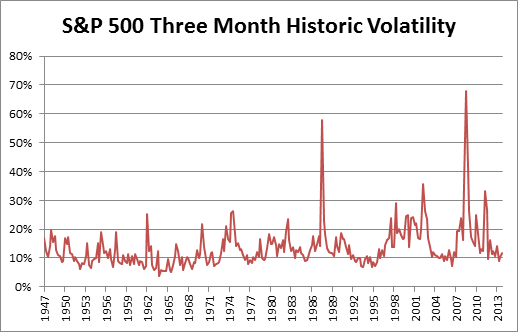 The other time periods that volatility was low were good economic times, the early 50’s and mid 60’s. So while regulators might be worried about the formation of eventual imbalances, it’s much more likely for low volatility time periods to lead to future periods of low volatility and high growth. The next Minsky moment in the US economy is a long way off. 1. Keith Rabois has been raising money for a company that is likely to eventually be a REIT that will be easily funded thanks to its Silicon Valley halo. 2. Some of the odder parts of Transformers explained. (HT: Vasu) One of the interesting side effects of the rise of the Chinese consumer is cameos by pop stars and famous atheletes in blockbuster movies that are totally unknown to US consumers. 3. A Harvard professor demonstrates that social scientists suffer from significant cognitive biases when their status is called into question by others who fail to replicate experiments meant to prove subtle effects such as various priming scenarios. (HT: MR) The belief that most sociological theories tested in the lab are as true and unrefutable as the existence of black swans leads to silly attempts to defend them from criticism. One point that is worth thinking about is how to fully align the incentives of those who replicate studies with truth seeking behavior - if studies are only replicated when there is an axe to grind then there will be false negatives. But the proper answer to this problem should involve raising the status of those who replicate published studies rather than denigrating them. Pre-registering experimental methods (as the author suggests) - and publishing the results regardless of the outcome - would also help. 4.Tim Harford points out that low volatility is pretty consistent with good economic times. Before low volatility leads to high volatility and disruption, it leads to more low volatility growth. 1. Politics is not about policy - it's about who deserves higher status. Exhibt #5,271: The reaction to the Hobby Lobby SCOTUS ruling. (The SCOTUS is not to be confused with SCOTUSblog). 2. Facebook's psychological study caused a minor scandal, even if it didn't necessarily do what it claimed to do. On the one hand, this can be seen as worrisome that Facebook modified newsfeeds of some users and might have made them feel slightly worse. But on the other hand - it's seen as unethical to reproduce so many of the landmark experiments of our time and it is interesting that private companies have the potential to fund and run smaller experiments in potentially less regulated environments. 3. The value provided by HFT. Barclays wanted to pretend to pretend that they didn't have any "predatory" HFT firms in their system but without those firms they wouldn't have the liquidity to run their own dark pool. 4. Unfortunately for those growing up in poverty, peer group effects are very important. This link is quite relevant for anyone wondering whether or not they should utilize San Francisco's public school system. Campbell R. Harvey, Liu and Zhu present an analysis where they find that academic papers on cross sectional stock market factors are apparently about as untrustworthy as a large portion of medical literature. (HT: MR) Published papers in medical literature and on stock market factors suffer from data mining and publication bias issues where only positive results are analyzed and published. Not finding something is rarely seen as an accomplishment in the academic world. So after thousands of analysis are run, the paper that finds something that is only 1% likely to be a misinterpretation of random noise if you only did the study once - is likely to be exactly that - random noise. However, it's interesting that even with this bias there are still some very significant results to be found in cross sectional analysis of stocks. The stand out stock market cross sectional factors are value and momentum, which work well enough that even if they have been found by an explicit data mining processes the returns are good enough to suggest that they aren't just random noise. The explanation behind value working is simple. Stocks trading at the largest premium to their book values are overvalued by overconfident market participants on average while stocks trading at lower book values are a bargain more often than not. The value approach is well known, with Warren Buffett being the prime example of a successful investor who utlizes the value approach. Momentum is more interesting because it is less popular among the public. Adherents to momentum have often been denigrated as rash speculators, in contrast to the more stable and patient value investors. Momentum is the idea that prior price movements are preditive of relative future returns. This seems to be a violation of the weakest form of the efficient market hypothesis. Adherants to the EMH call momentum (and value for that matter) a "risk factor" - implying that stocks with higher momentum have a higher risk than low momentum stocks which keeps their theories from completely falling apart. But the actual mechanism behind momentum is more subtle- a fast growing company doesn't become a sensation overnight. It takes time for a company to overtake and replace its rivals even if the new company is better in almost every way. Along the way, small pieces of information will come out regarding the increasing success of the company and the well performing stock will be bought by more managers. The extra risk is that a market shock could induce aggressive managers to all sell their holdings at once or worse, change the environment that was making the company so succesful in the first place. Momentum, value and small stocks are three of the classic cross sectional explanatory factors, with data on their performance available for download at Ken French's database - so the lack of significance of the small stock outperformance as determined by Harvey et al is notable. I've touched before on how public stock market size premium is likely to be lower than it has been in the past due to high valuations in the pre-IPO environment, but this suggests that looking to small stocks as a significant explanatory factor of performance might have always been a mistake. Size shouldn't be ignored - many people have found that value works much better among smaller stocks. The table above from Cliff Asness's white paper shows that momentum works slightly better among small cap stocks, though this result may occur more because small cap stocks are more volatile in general and not because momentum works any worse in the large cap world after adjusting for volatility. Momentum works in multiple asset classes, and should be of interest to those who are pre-IPO investors. Everyone knows to invest in fast growing companies and to avoid companies who have had to take down rounds. An explicitly systematic momentum approach in pre-IPO companies is likely to generate significant alpha - particuarly in our current investment environment. So when the value perspective of the 17 billion dollar pre-money Uber valuation can make the deal look ridiculous*, the investor who respects the momentum factor should be paying closer attention. After all, it seems far more likely that the dynamics of investors demand will have the company trading at a 30 billion dollar valuation before it trades at an 11 billion dollar valuation. *The analysis underweights the increasing utilization of taxi-cab like services that the presence of Uber encourages, but apart from that it appears to be about as close to accurate as a valuation expert can be with the available information. In which I cover many prior topics in one post instead of making many follow up posts. 1. When will prosecutors go after Silicon Valley? 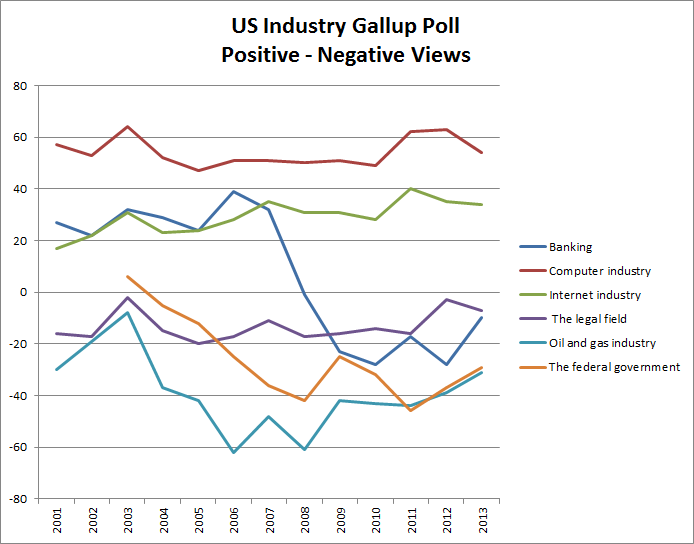 Looking at Gallup's 2013 industry poll we can see that tech is still more popular than the oil and gas industry ever was, and is currently viewed far more favorably than banking. 2. Following up on 10,000 hours of non-deliberate practice. The Economist looked at how much time is wasted passively watching a video. Gaming seems to be a closer substitute to work, given how both require problem solving. And the amount of time spent on gaming is growing - with 43 million people playing games for 22 hours a week in the US alone, gaming is one of the largest time sinks of intellectual power in human history. 3. High Frequency Trading - One additional worry is that trading firms pay for customer flow because they profit, but this seems much more about locking in their ability to arbitrage this flow without competing with other HFT firms rather than taking extra advantage of the retail investor. 4. Another example of 60's Conglomerate math. When Facebook bought Whatsapp, some analysts justified it on the basis of how the purchase was cheap for Facebook on a per user basis. Just like analysts in the 60's thought that when a growing company bought a stagnant company the stagnant company's earnings should be valued like a growth company, analysts are assuming that each user acquired brings a similar value to the Facebook shareholder as a current Facebook user. Facebook's purchase might make sense strategically and might make even more sense if they violate their pledge to not serve ads to Whatsapp customers a few years down the line. But investors should constantly remind themselves that the earnings/revenue/users of one company is likely to be significantly different from that of another company. Any company using its high valuation to make significant acquisitions should be analyzed carefully so the effects of the acquisition aren't mistaken for intrinsic growth. 1. A lot of private equity shops can get away with charging more fees than they agreed to because their limited partners (more specifically, those who invest on behalf of the limited partners) seem to have an attitude of "Don't blame me, I invested in a famous name!" On top of this, the people making capital allocation decisions for pension funds are often onto their next job before the results of their fund investments are known. Maybe the next CIO of Calpers can do something smart in this area. 2. Conferences like Bilderberg are unlikely to involve any real conspiracy, but like any off the record meeting between government officials and business leaders there is "access." The meetings give those on the business side a chance to try and figure out and potentially influence future policy moves. Unfortunately, it is hard to tell which politicians will play along in return for favors and which politicians merely want opportunity to hear the perspectives of those present on an ex-ante basis. 3. The number of freshman deciding that they want to be computer science majors is way up. The students who stick out their major for four years will probably be mildly disappointed by what the startup landscape looks like four years from now. Some combination of a higher supply of programmers, more institutionalized processes and less extreme early stage valuations is likely to make their careers less exciting than their peers graduating today. But overall it's still a smart choice. Even if their jobs aren't directly related to coding, the general ability to be comfortable thinking algorithmically will be as important as thinking quantitatively. 4. One of the more sane perspectives on school shootings in general. More generally, it's sad how many different interest groups try to get media exposure for their favorite pet issue in the wake of high profile tragedies. 5. Occupational licensing - keeping both prices and unemployment high! 6. Looking at this extreme inequality, we are reminded that politics isn't about policy. It is about who deserves high status. The Conglomerate Boom of the 60's, like all bubbles, sounds ridiculous in hindsight. From 1965 through 1969, the market was obsessed with rising earnings and investors didn't seem to care if the earnings came from new business or from buying other business. As long as earnings growth was up the company would keep its high valuation multiple. The basic formula was that a fast growing company valued favorably by the market would use their stock to purchase low growth companies - and the earnings of the combined company would have the same multiple as the fast growing company. Investors didn't seem to realize that the low growth company's earnings wouldn't magically start growing just because it was bought by a company with a high multiple. The total valuation of the combined company would be higher than the prior valuation of the separate companies. The market's irrational behavior created incentives for unnecessary mergers. This lasted as long as the credit financing mergers was cheap (Conglomerates didn't have to properly account for convertible debt until 1969) and the market was willing to give high valuations to companies that produced earnings growth through the acquisition of other companies. We might be seeing the start of similar incentives in today's private early growth stage companies. Most of the new start up companies are seen as competitors with the potential to disrupt whole industries. They are judged more on revenue than on earnings since the logic is that revenue will be more easily turned into earnings after the competition is decimated. Winning is what matters. Whenever there are successful companies attracting capital and getting high valuations, there are less successful companies who will only succeed in mimicking the visible traits of successful companies. This creates some perverse incentives. The valuation given to successful growth companies is anywhere from five to ten times revenue - or higher. Meanwhile, the average company in the S&P 500 is trading at 1.7 times sales and the smaller companies in the Russell 2000 are trading around 1.2 times sales. Right now, it should be very tempting for a variety of early growth companies with high valuation multiples to go out and use their stock to buy companies with old economy valuations, point to total revenue growth, and hope that investors don't significantly change their valuation multiples. Lending Club's $140 million cash and stock acquisition of Springstone Financial LLC looks like a good example of the conglomerate boom dynamic resurfacing in the current market. Lending Club is currently valued at 40 times its 2013 revenue, which appears to be significantly more than Spingstone Financial was valued. If the market mistakes the additional revenue from Springstone as indistinguishable from growth in Lending Club's core business then the acquisition will push up the market value of Lending Club's future IPO. This could happen regardless of whether or not the move into financing private education and elective medical procedures works out for the company in the long run. For those looking to make long term investments in growth stage companies, it's important to make sure that the revenue these companies are valued against is the type of revenue that can scale and not revenue gained from the acquisition of businesses. Nostalgia for the 60's should have its limits. 1. The DOJ is finally putting pressure on the Chinese government hackers that have been attacking multinational corporations for the past decade. It seems like the main difference between the Chinese and the Russian hackers is that Russian hackers are more often working purely for ways to immediately enrich themselves via theft/fraud, while the Chinese hackers have also mounted operations to support their state-owned enterprises. I wonder if the calculation of real return on equity for state-owned companies in China included these services as part of their hidden subsidies. 2. The seemingly increasing closed mindedness of the political youth is an interesting phenomena. Between these graduation speaker protests and requests for trigger warnings on class material, it's hard to tell if the college students have gotten crazier or if the rest of society has gotten used to taking crazy people more seriously. Beyond the volatility around technology valuations, a further risk to Twitch is that a very significant portion of their viewers come from a single game - League of Legends (LoL). Many of the popular LoL streamers are paid directly by Riot, the owner of LoL. If Riot decided to make their gamers stream on a platform of their own creation then Twitch could lose a lot of eyeballs/advertising revenue. If Riot does this successfully, it shows that those who own the games can choose to monetize their streamers directly unless Twitch works to keep them on board. This could lead to a situation where the economics of Twitch resemble music streaming services more than Youtube channels. If viewers left to watch their games on other services, this would also show that Twitch viewers aren't necessarily as sticky as Twitch would like buyers to think*. *Whether or not users will stick around in the long run seems to be one of the big questions when it comes to the valuation of many current tech companies.